The Rhode Island Mini Maker Faire returns for its sixth year on Saturday, October 11. This is the first year we’ve done this as an independent, stand-alone event after combining it with both WaterFire and the AS220 Foo Fest in years past. AS220 and RI Mini Maker Faire founder Revolution x Design have teamed up to make this the biggest RI mini yet. Thanks to support from our principal sponsor Hasbro, our Kickstarter backers, and other sponsors such Red Pitaya and Trinity Rep, we’ve expanded to cover three locations in downtown Providence, and have nearly fifty makers exhibiting. Rhode Island is the perfect place for a Mini Maker Faire. It’s where the American Industrial Revolution began, when Samuel Slater snuck out of Great Britain in disguise in 1789. He needed the disguise because you weren’t allowed to leave there if you knew how to spark an industrial revolution. He arrived in Pawtucket, Rhode Island, and made machines. Rhode Island was also where sewing machine inventor George Henry Corliss came in 1844. He turned his talents to improvements in steam engine technology, and made a steam engine so efficient that European manufacturers produced knockoffs, even affixing Corliss’ name to their counterfeits. One Hasbro Place, Providence RI: Come check out everything from Hasbro’s Doh-Vinci to their Kre-O construction set toys, and get a look at what Hasbro animatronics look like under the skin. Adrian Hall Way: We’ll be closing down this street to showcase dozens of local makers. Check out Jeff Del Papa’s manhole cover-sized coin flipper, local robotics and science organizations, 3D design and printing exhibits, music, beer brewing, crafts, and other creations. 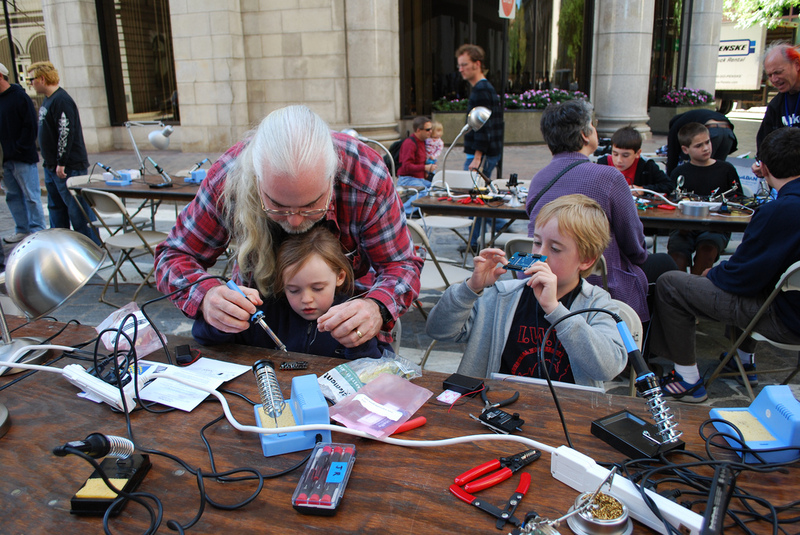 AS220, 115 Empire St: We’ll be taking over AS220’s performance space with AS220 Labs’ learn to solder workshops, pinball machines, LED cubes, and microcontrollers. (Rain location for some exhibits will be AS220’s 95 Empire space). Check out all the makers who will be at the Faire. You can purchase tickets in advance at EventBrite, or buy them at any of the ticket booths we’ll have at the Faire. See you Saturday!